I have found this sentiment to be common among the GF community–love, support, respect. It’s a beautiful sort of openness that has helped me, and undoubtedly helped countless others, believe that this lifestyle is not only possible, but can be amazingly fulfilling. Perhaps this is why I felt a bit surprised and concerned this past week upon reading a warning issued by the Celiac Foundation regarding Elisabeth Hasselbeck’s recent publication The G-Free Diet: A Gluten-Free Survival Guide . As I said, I’ve not yet read the book, so I cannot provide my assessment as to whether or not the information contained within is entirely accurate. It troubles me, though, that the Celiac Foundation seems to be taking such an antipathetic stance on self-diagnosis. Their website, as well, is interspersed with strong language and bold lettering that seems to denounce self-diagnosis in its entirety. I’ll stand up and say that this is a question that I’ve struggled with myself. I like to consider myself a woman of science (I minored in Anthropology for fun, after all). I question everything and require a verifiable hypothesis with test results that can be duplicated before accepting, well, pretty much anything (I’m also a bit of a nerd). So, it was a great source of internal conflict when, after being GF for some time and experiencing the incredible absence of pain and discomfort that accompanied this lifestyle, I learned that one must be on a non-GF diet to be properly diagnosed. For me, the evidence has been overwhelming. I eliminated gluten from my diet, and all of my symptoms disappeared, including things that could be definitively shown on paper, like the anemia. The time that I found a plate of sea scallops topped with a light bread crumb crust placed in front of me and thought, “Well, I’ve been off it long enough now that this little bit probably won’t affect me,” I wound up struggling to contain myself through the final moments of an off-Broadway show just a couple hours later. Needless to say, I’ve never thought “Oh, just this one little bit won’t hurt…” again. Choosing sushi for lunch one day left me wondering later on why my formerly ER-worthy pains had returned when all I’d eaten was fish, seaweed, rice, and soybeans. This was how I discovered that soy sauce contains wheat. When I eat foods that contain gluten, I hurt and my body isn’t right for days (up to a week) afterward. When I avoid it, I feel wonderful. For me, this has been enough. Upon speaking with my doctor regarding the possibility of Celiac, describing my former symptoms and the marked improvement since going GF, I was told that this was likely what I had. Despite being GF for four months, the blood test was performed and, unsurprisingly, came back negative. My doctor’s professional opinion–if you feel better when you don’t eat gluten and the symptoms return when you do, just keep doing what you’re doing. The only treatement for Celiac disease is a lifelong elimination of gluten from one’s diet, so an official diagnosis would only confirm the self-prescribed and doctor-approved lifestyle that I’d already adopted. And to obtain an official diagnosis? I’d have to subject myself to weeks, more than a month, of eating non-GF and all the awful feelings that would accompany the reintroduction of such foods into my diet. I’m sorry, Celiac Foundation, but I’m not prepared to do this at this point in my life. And, to be completely honest, I do not fault anyone else who discovered their intolerance for gluten in a way that will no longer allow them to receive a proper diagnosis and does not want to subject themselves again to the perpetual discomfort with which they once lived. It’s surprising to me that anyone who has experienced this pain, and the incredible transformation that comes with changing one’s diet, could have such disdain for these individuals. From an intellectual place, I do understand the importance of medical diagnosis, and would encourage those who believe they may be gluten intolerant, and have not yet gone GF, to contact a physician as soon as possible and obtain a diagnosis so that they may begin to heal. Discounting those who have self-diagnosed, however, seems to countervail the loving and supportive sentiment that I have found among the GF community. I personally find such denouncement unfortunate and disappointing. 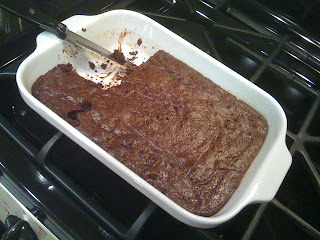 And what better way to honor the light within yourself than with a delicious, gluten-free brownie? There are many wonderful GF brownie mixes out there, but my obvious choice tonight is this one , prepared according to package directions with half a bag of dark chocolate chips folded in for an extra bit of gooey goodness. So, cut yourself a brownie, honor yourself, honor those around you, and, by all means, enjoy! Love this post and I agree completely. I put myself on a gluten-free diet and tested it myself to a very uncomfortable result. The test for celiac is not always accurate and invasive. I don't want to put myself through that now that I'm finally feeling good.